We are currently writing our latest short film named “Operation Iron Horse, and we hope to start filming within the next few weeks. Volunteers looking to take part in front of the camera are welcome; we can use two more hostages and some other extras. Filming for this project should prove interesting; guns, explosions, hand to hand combat and a small group of people running around two different abandoned locations. We will be throwing a lot of visual effects into this short film, including some new stuff [such as overhead UAV footage, vehicles, possibly helicopters, thousands of rounds of ammunition and maybe even a surprise or two]. Keep your eyes and ears open; soon after filming, both the action short and behind the scenes footage will be publicly broadcast. If you’re wanting to volunteer, do so now…shoot dates are coming up soon! Although this is being written in a format more as a FAQ than a discussion, understand that I am writing this in an attempt to help benefit other filmmakers out there. First I would like to say, that if you plan on having anyone play the part of a military person or police person, you should look into obtaining a consultant and not just rely on ‘what you have seen on tv’. I have seen many films out there where the ‘realism’ has been lost just on an actors inability to pull off the “walk and talk” of their character [being based on a military or police person]. Usually, finding someone to act as a consultant is somewhat easy. You can either contact or inquire with a local or state film office or commission (many film offices have lists of different crew and consultant people (such as the Pittsburgh/Pennsylvania Film Offices and the Greater Cleveland Film Commission as examples)). You can also seek out someone who is either active military/police or prior service military/police. I will say though, the issue most common with the latter of the two is the ability to work efficiently with a Director or a DOP. Let me say that the issue is a lack of desire to work with a filmmaker; you have to just understand that a person in that position has been doing the ‘Tactical and/or Standard Operating Procedure’ gig for a while and it can usually be “by the book”. I say this because it is not that he or she does not care about your vision, they are just use to operating and doing things in a certain fashion and it is not easy to stray away from that “SOP”. The benefits though, can be huge. That ‘consultant’ can point out small flaws in your script (which is not exactly a bad thing). They are going to want to make it as realistic as possible because that is how they have been trained. If something seems unlikely in the script, that consultant will probably point it out. At the same time, they also have the ability to show you methods or techniques that you may have not even thought of. Granted, in the end of all of this, after production, post production and distribution (if you didn’t go with a consultant) half of your viewers may not even notice any production errors or hiccups in lieu of your military or police characters, their speech, actions or tactics. But be sure that military or police personnel and prior service veterans will point out a majority of those errors and will generally point them out to their friend and co-workers. In my personal opinion (as both a filmmaker and a prior service military veteran with tours in Iraq and with the Department of Defense) I would highly suggest either hiring or ‘borrowing’ a military/tactical consultant. It will make things a little bit easier and more convincing in the long run. You can probably even procure one of these consultants for either little or no cost just on general principle. Target Engagements from 15 to 1100 yards. It may be a little known fact, but the two main founders of Laythrom Media are prior service military personnel. In fact M. Adkins [Laythrom’s CEO and Director] was a Military Police Officer and Special Response Team Operator (like police SWAT) in the US Army for several years as well as an Officer for the Department of Defense and C.Rosier [Laythrom’s Chief Operations Officer] was a Munitions Specialist and Security Police Officer in the US Air Force. We decided, not long ago, that we were going to launch an open invitation to all local police agencies. That invitation is for [OPFOR] Opposing Force, Force on Force Training. Well, what does that entail, you might ask…I’m glad you asked. 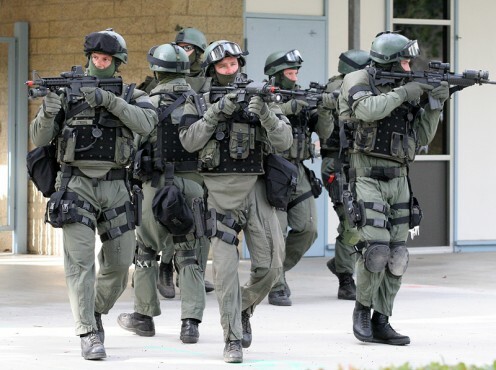 We will be covering a wide variety of tactics and scenarios, from different tactical weapons carries to building/room clearing, trap and contain quadrants, High Risk Warrants and Drug Raids, Tactical Vehicle Handling, Tactical Weapons handling (including tac reloads and clearing), and Hostage Situations to name a few. Well, it is our belief that local law enforcement should train with people who are trained to play both sides of the fence (so to say), not to mention people who like to think outside the box. It is one thing for police officers to train with other police officers [typically “by the book training”], but it’s a whole new ‘horse of a different color’ when you have outside personnel throwing a monkey wrench into the gears. Besides, who wouldn’t love strapping GoPro cameras to M4s and everything else in between; the footage alone should look B-A.